When anyone asks what steps they should take to reduce waste, composting is one of my top answers. 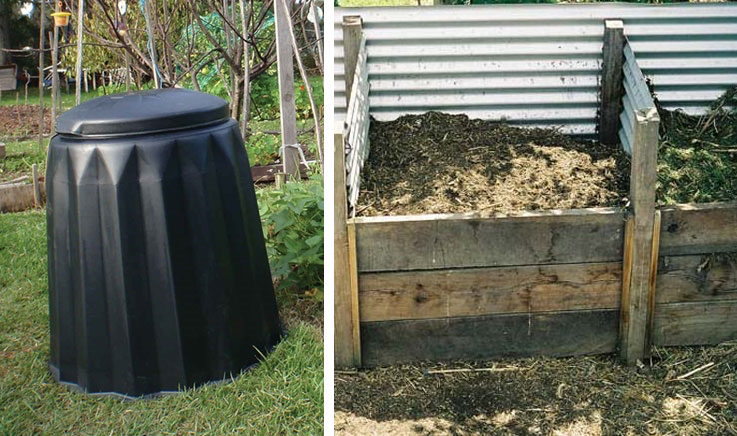 This blog post covers ten composting systems for the person with a large backyard to the apartment dweller. Composting became a non negotiable when I began the journey to reduce my rubbish. It was the quickest way to reduce what went into the bin each week. Over 40% of our bins are made of food waste. The combination of our garbage in plastic bags and the way landfill is configured, means that the food won't break down properly. It can take up to a year for food wrapped in plastic to decompose. Huge amounts of methane gas is created, a potent green house gases. Our food (the normal unprocessed stuff) is designed to break down in soil. There are all types of insects, bugs and worms that will eat it up, helping return nutrients to the soil. When food scraps are composted, they don't become waste anymore, instead they are food, for the soil. The act of composting embodies the quote “there is no garbage in nature.” It's closed-loop perfection. Composting also renders a plastic bin liner obsolete. This is the biggest obstacle people seem to have, when wanting to give up plastic bags. If nothing wet, like food scraps, is going into a bin, the plastic bin liners are really not necessary. Great for those with a backyard or apartment complex with a shared outdoor garden. This type of composting is what I grew up with and what I do now. It is very simple to set up. The one thing that is needed is some space. You can straight away by picking a place and begin adding food scraps, garden off cuts, leaves, paper. Or grab some planks of wood and square off a space. We created one out of a metal garbage bin, then we decided to make a larger one using scraps of wood down the side of our house (we don't really have a backyard). We still have the metal one - now it holds our finished compost before it goes onto the garden. If you are putting your scraps right onto soil, worms will come along the party. But if your compost is contained, grab a box or worms from your local nursery or ask friends if they have any to spare. Hardware stores also have a range of ready made bins too. The idea is to add green and brown to the compost. The green part is the food scraps and some garden off cuts (think cut grass or weeds). Green is the nitrogen. Adding brown, the carbon, helps to balance the nitrogen. So things like paper, wood, leaves or left over mulch. It's not a necessity to get the balance right. Your scraps will break down, it will just take a little longer. You will need to turn the compost at least once a week. So grab a shovel or pitchfork, and turn turn turn. This helps feed oxygen in. If you turn the compost (also known as aerating) it won't smell. It is best to put this type of compost in an area that does not get too much sun, to prevent everything drying out. If you notice the compost is a little dry when turning, water it until moist to keep your worms happy. Don't think that an acre of land in required for this type of compost. We built our compost on the side of our town house in suburbs. A garden compost can be altered to fit where you have enough space (at least two to three metres). Apartments with a shared garden space, can also get a similar option going. Speak to your body corporate to see if they would allow one on the communal garden. Some councils also provide discounts on ready made garden composting bins. Worm farms are a great alternative for those with less space or who don't want too add anything other than food scraps and the occasional water. It's a simpler method, with many places selling worm farm kits or you could try making your own, using a variety of materials. Kits come with 1,000+ worms. The brilliant thing about worm farms, is the juice produced. This is liquid gold for plants, as is the castings. Like a compost heap, worm farms do better in a shady position. Most worm farm kits are not made of man made materials, and can heat up if in direct sunlight for a long period of time. I have seen worm farms set up in garages, on balconies, in courtyards or along the side of the house. Check Gumtree.com.au for second hand options or visit youtube to learn how to make your own. For apartment dwellers, small spaces and those who want easy access. Composta is a wormfarm and garden in one. It uses your everyday kitchen scraps and the magic of composting worms, to produce organic fertiliser, which feeds the plants growing within the pot itself. It's clean, easy to use and does not take up much space making it perfect for apartments and units. The appeal of the Bokashi bin, is that it can be kept inside, on the kitchen counter or in a cupboard. It's 1.5 litre size means it won't take up too much room. The added bonus is, there is no smell AND it will take meat and dairy. It's not a compost in the traditional sense, instead the food scraps are broken down by a fermentation process. As the scraps are put into the bin, users then sprinkle the Bokashi One Mix. This is full of micro-organisms that ferments the food in an airtight bucket. Like the worm farm, juice is collected at the bottom and used as fertiliser on plants. However, a Bokashi bin will not reduce all the waste to liquid. It does need to be emptied once full. This means users need to find somewhere to drop off the compost if they don't have a garden. Otherwise, dig a hole in your garden, drop in and cover with soil. There is also the added expense of buying bags of the Bokashi One Mix each time. I first discovered electric composting through Joost Bakker's zero waste cafe. An electric composting unit, needs, well electricity and food scraps..and depending on the type of machine, some type of brown part (sawdust or paper). And everything is turned into compost within a 24-48hr time frame. Most food can be added to the unit too; fruit, vegetables, meat, dairy, paper, teabags excluding hard shells like oyster and scallop shells. Large bones are also discouraged. I imagine if then are used in a stock a couple times, then the bones could be fed into the unit. Units for the home can range from a couple hundred dollars. Yes, it carries a bit of price tag, and I imagine there might be some noise. But I think for a large family or even shared by apartment dwellers in a communal space, it would be a savvy investment. The compost can be used for the garden or passed onto others. When I first discovered the wonder that is electric composting, I thought about setting one up in our garage and encouraging neighbours to donate their food scraps, then selling the compost onto a garden centre. Possible business idea?! The only downsides appear to be the electricity usage and the potential smell if the balance between green and brown matter is off. I could not find how much it costs to run. Closed Loop Organics have a domestic composter called CLO'ey. This machine can compost 4kg of waste in 24hrs. (based in Melbourne, Sydney and London). 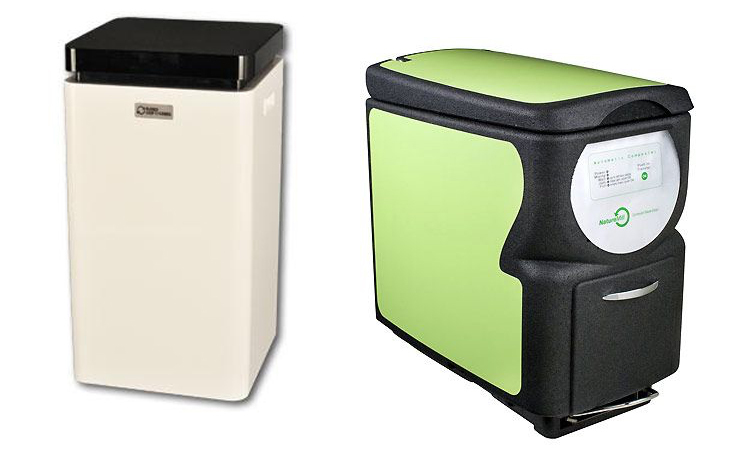 For apartment dwellers, small spaces or those not wanting to have a compost at the home. Most cities and towns have a community garden. It's a place where locals from surrounding areas can rent a plot and grow their own vegetables. And most of them have a compost. You don't have to own a plot to drop your compost off either. My best advise is to contact the community garden about dropping your compost off. Some places might be hesitant, due to people not adding the correct food scraps to the compost (for instance meat). If there are rules, they must be adhered to (It's only fair). Some places might also ask for help maintaining the compost or even a donation to go towards the community garden. Community gardens are usually open on Saturday's. This means saving your compost up all week. Before you start worrying about smell etc, I suggest saving them in a bag in the freezer. This will stop any smell. On the day you want to drop it off, take the bag out of the freezer. The bag can be washed out and reused again and again. Who knows, you might score some free veggies from members of the community garden or get inspired to have a patch of your own. If you are unsure about a community garden in your area, phone your local Council. They will know about all the options in your area. ShareWaste is an online tool that helps you find someone in your neighbourhood who's willing to accept extra waste and compost it. Visit sharewaste.com to sign up. Some schools, especially primary schools, have gardens and composts or worm farms on site as part of the children’s curriculum. If you are a parent of a child that goes to a school with a compost, ask if you could drop off your food scraps one day per week, offering to turn it. Just keep the scraps in the freezer during the week, so they don't smell. Another way to get composting, is to approach friends that have their own compost, worm farm or even electric composting system (the Bokashi bin would be too small). Ask if you are able to bring around your food scraps. I'd happily let my friends bring around theirs (i'd ask them to give the compost a good turn). Again, the scraps can be left in the freezer until the you need to take them around. Compost collectors is something that I came across when I was in the US last year. When I found out that there are business that charge a fee to take your food scraps and bring back a bag of compost, I wondered if there was anything like this here in Australia. Brisbane: Mallow Sustainability. They currently only take from cafes and restaurants green waste. But that could change if there is demand. What do I keep my food scraps in, before they go to the compost? Usually a normal ceramic food bowl from our cupboard. We collect everything into the bowl while cutting/cooking and then empty into the compost before we go to bed. Sometimes it's a mad dash in the rain. I know some of these options are made of plastic. It is near impossible to find plastic free solutions for smaller homes. I see it this way - if a plastic composter or worm farm is going to be used for a very long time and keep food out of landfill, then I don't see it as particularly bad decision. 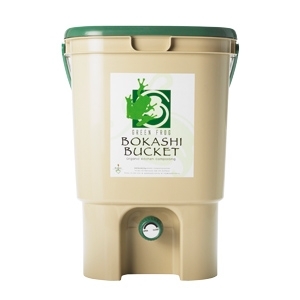 The worm farms and bokashi bin can be found made of recycled plastic. I'm not anti plastic, just anti the misuse...and I don't see competing as a misuse. Let me know in the comments below about any tips you have for composting. What can we do to make composting cool again? If you don't compost, I'd love to know why it does not appeal to you? Is it the space? Time? Smell?